1,25(OH)2D3 is a lipid-soluble vitamin which plays an important role in calcium metabolism. It also plays an important role in maintaining oral health through bone and mineral metabolism and innate immunity. Osteoporosis is loss of bone when there is an imbalance between bone formation and resorption. In osteoporosis, loss of bone density may render the host highly susceptible to periodontal destruction. Thus, there might be a possible association between Vitamin D, osteoporosis, and periodontitis characterized by loss of bone. Thus, understanding the underlying mechanisms of these associations will help improve prevention, diagnosis, and treatment of these diseases. A systematic search of the literature was conducted in the Cochrane Library, PubMed, Web of Science (ISI), Scopus, Copernicus, and Lilacs for full articles published until 2015 for this review. Periodontitis is a pathological inflammatory disease of the periodontium triggered by specific microorganisms resulting in the loosening or loss of teeth. Although these microorganisms are responsible for the initiation of periodontitis, the rate of progression is modified by several risk factors such as systemic diseases, cigarette smoking, medications, ill-fitting bridges, pregnancy, or use of oral contraceptives. In the past few years, several studies have stressed upon the relationship between periodontal disease and various systemic diseases. An inflammatory response is mainly due to the action of infectious and opportunistic microbes responsible for periodontal infection. Periodontal infections are believed to be reservoirs for various bacterial antigens, cytokines, Gram-negative bacteria, and other pro-inflammatory mediators responsible for the systemic spread of diseases. An association between periodontitis and osteoporosis is considered to be due to the action of pro-inflammatory cytokines and prostaglandins. These diseases are said to be linked due to the presence of these mediators. A major risk factor leading to the development of osteoporosis is lack of Vitamin D and calcium. Vitamin D helps in the regulation of calcium metabolism and also plays an important role in the immune system, the cardiovascular system, cancer, diabetes, and chronic illness (Adams and Hewison, 2010). Its significant role in maintaining calcium homeostasis indicates its importance in skeletal health. Thus, the rate of both bone loss and deposition depends on genetics and calcium availability. 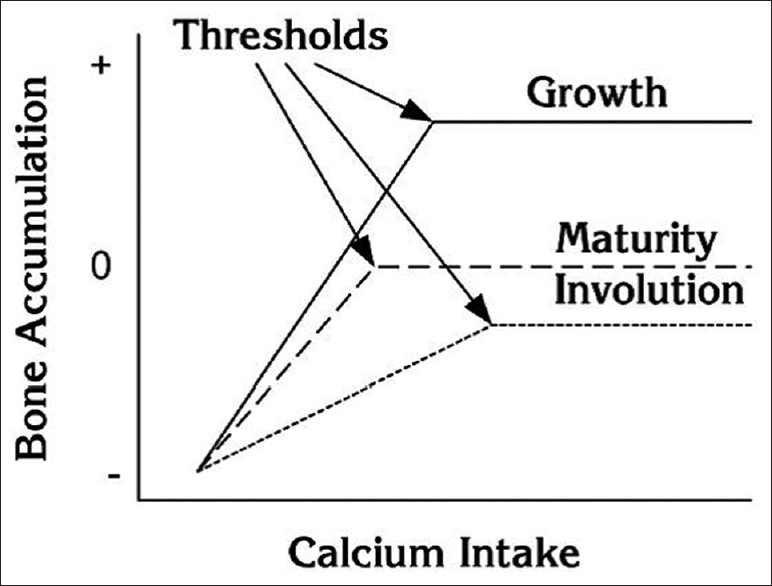 For the human body, calcium is not utilized even if the intake of calcium crosses the threshold value [Figure 1]. In particular, extracellular fluid levels of calcium are maintained at normal physiological limits by mainly two calciotropic hormones (parathyroid hormone [PTH] and Vitamin D). Since Vitamin D plays an important role in bone maintenance and immunity, deficient levels of Vitamin D can affect the periodontium. Osteoporosis, “too little bone in the bones,” is most commonly seen in elderly women. 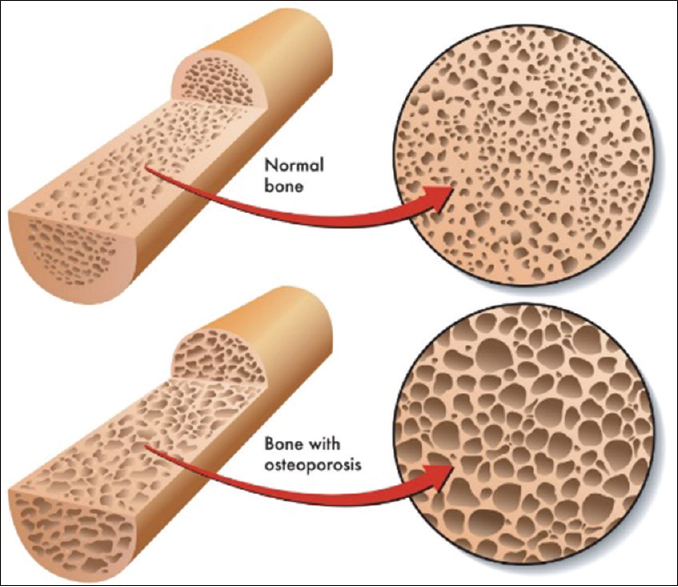 Osteopenia together with osteoporosis is loss of bone which occurs due to a misbalance between resorption and bone formation, with an increased tendency to resorption. Characteristics include reduction of bone strength, mass, and microarchitecture causing demineralization, thus resulting in increased tendency of bone fractures [Figure 2]. As loss of alveolar bone is an important factor of periodontal disease, severe osteoporosis can be a provoking factor in periodontal disease. Osteoporosis is of two main types: primary and secondary. It occurs due to bone loss from the skeleton with advancing age. It is the more common form and is of two types: Type 1 and Type 2. Type 1 is also known as postmenopausal osteoporosis. It affects 5%–20% of women, most commonly occurring in the sixth and seventh decades of life. The main cause includes estrogen deficiency which results in greater loss of calcium from bone due to increased sensitivity to PTH. This consequentially reduces the secretion of PTH and the production of 1,25-dihydroxyvitamin D and calcium absorption, eventually causing trabecular bone loss. Thus, lack of estrogen is the main cause of bone loss in at least 75% of women during the first two decades after menopause. Type 2 is also known as senile osteoporosis. The main cause includes reduced bone formation along with reduced ability of the kidney to produce Vitamin D, resulting in decreased calcium absorption thereby increasing PTH levels and thus bone resorption. Loss of trabecular and cortical bone thereby increases the risk of long bone and vertebral fractures. It occurs as a manifestation of other systemic diseases that can cause bone loss and is classified as Type 3. It can occur equally in men and women of any age. It presents itself as a manifestation of hormonal imbalances, cancer, gastrointestinal disorders, hyperthyroidism, chronic renal failure, hypogonadism in men, rheumatoid arthritis (RA), osteogenesis imperfecta and related disorders, malnutrition, etc. Idiopathic juvenile osteoporosis is an uncommon, self limiting disease which is mainly characterized by vertebral and metaphyseal fractures before the onset of puberty. Newly formed metaphyseal bone subjected to weight or immature bone under recovery are the most common sites of fracture(Bartal and Gage, 1982). To diagnose IJO, other common causes of osteoporosis have to be excluded. Once diagnosed, management mainly includes limiting the symptoms and permanent deformities. Although various methods have been used to treat IJO, no specific treatment has been established. Corticosteroids are widely used to treat patients with chronic inflammatory diseases such as RA and connective tissue diseases. Patients on high-dose corticosteroids experience maximum bone resorption in the first 12–24 months. Thus, the main aim of the treatment is to use the lowest dose of corticosteroid possible and withdraw corticosteroids whenever possible. It has been established that corticosteroid osteoporosis may be reversible to some extent and, if the patient is on corticosteroids for not >6 months, the risk or extent of bone loss is significantly lesser. Risk factors for osteoporosis can be divided into nonmodifiable and modifiable. The nonmodifiable risk factors for osteoporosis include gender, age, early menopause, thin or small body frame, race, and heredity. Modifiable risk factors are lack of calcium and Vitamin D, lack of exercise, smoking, and alcohol consumption. One of the major methods used to measure bone mineral density (BMD) today is dual-energy X-ray absorption (DXA). The uses of DXA, introduced in 1987, involve measurement of BMD in central sites and peripheral sites such as the spine, hip, or radius. DXA, being a well-standardized technique, has several advantages such as high precision, minimal exposure to radiation, and easy to use. BMD determines the bone strength and is used to define osteoporosis and osteopenia. Other methods used for assessing bone include absorptiometry (single-photon absorptiometry and dual-photon absorptiometry), quantitative computed tomography, measurements from radiographs, panoramic films, intraoral films, and computer-aided digital image analysis (CADIA). WHO defines  osteoporosis by a BMD measured as two and one-half standard deviations below the average peak bone density achieved in young adults matched by gender and race. The “T”-score also represents the difference (expressed in terms of standard deviation) from the peak bone mass for the population. The Z-score compares a patient's BMD to a race-, age-, and gender-matched population [Table 1]. Bone loss occurs largely in women, especially after menopause. Only 15% of women in a healthy young population have a T-score of <–1 and thus have reduced bone mass or osteopenia. Approximately 0.5% of the women have a T-score of −2.5 or less, indicating the presence of osteoporosis [Figure 3]. Furthermore, the incidence of osteoporosis-affected women at any one anatomical site increases significantly with age in much the same way as fracture risk increases with age. Radiographs provide measurements such as the thickness of the cortical bone. Digital radiography utilizes the digital representation of a radiograph to evaluate any variations in either the bone height or density. The conventional digital technique has been modified to assess bone density from dental radiographs. CADIA is a similar technique that utilizes algorithms to exploit any gray-level information from radiographs. The underlying concept is that the surface roughness of osteoporotic bone and normal bone is different. Dense trabeculation indicates high BMD, while sparse trabeculation is used to indicate low BMD. The WHO definition applies mainly to postmenopausal women. However, corresponding to the International Society for Clinical Densitometry guidelines, they can also be applied to men older than 50 years of age. Under normal physiologic conditions, a balance between bone resorption and bone formation promotes bone homeostasis and calcium metabolism and maintains the structural integrity of bone. In the presence of inflammation, either bone formation or bone resorption is enhanced., Excessive bone formation may be due to either increase in the osteoprotegerin (OPG) levels or decrease in the expression of RANKL, thereby resulting in elevated OPG levels or a reduction in the RANKL/OPG ratio [Figure 4]. During inflammation, pro-inflammatory cytokines induce osteoclastogenesis by increasing the RANKL/OPG ratio and anti-inflammatory mediators may decrease the RANKL/OPG ratio. Bone as a living, dynamic tissue undergoes constant remodeling by the action of osteoblasts and osteoclasts. In a young healthy population, bone formation exceeds resorption, but this is reversed in the later stages of life. This constant turnover can be measured by molecular markers which indicate the extent of osteoblastic and osteoclastic activities. These bone turnover markers (BTMs) are divided into three categories: (1) bone resorption markers, (2) osteoclast regulatory proteins, and (3) bone formation markers. However, in pathological conditions, normal homeostasis of bone is disrupted and alterations in the levels of these BTMs are well known in metabolic conditions such as osteoporosis and Paget's disease. They indicate osteoblastic activity. Fragments of type-I and type-III procollagen, type-I collagen C-terminal propeptide (PICP), and type-I collagen N-terminal propeptide (PINP) are the main markers of bone healing. Highly specific markers of bone formation include osteocalcin and bone-specific alkaline phosphatase. These can be collagenous or noncollagenous. The collagenous type measures the type-I collagen degradation and includes various peptide fragments. These respond differently to metabolic processes and are considered the best indices for assessing bone resorption. The noncollagenous type is the primary acid hydrolase accountable for bone resorption and includes tartrate-resistant acid phosphatase (TRAcP) 11 and cathepsin K.
Bone sialoprotein (BSP) is another sensitive marker of bone turnover and its serum levels can indicate the processes associated with bone resorption. Furthermore, the detection of the type 5b isotype, which is highly specific for bone osteoclasts, has facilitated an antibody capture activity assay for TRAcP 5b as a bone resorption marker. BTMs can predict the amount of bone loss when BMD by itself is not clear to assess individual fracture risk. BMD along with bone markers can improve the estimation of fracture risks in special cases. The association between BMD i.e., systemic bone loss and alveolar bone loss (ABL), has been established. Various factors for instance estrogen deficiency, genetic polymorphisms, Vitamin D and calcium deficiency, and several cytokines have been studied to justify the association between periodontal disease and both systemic and localized bone loss., Recent evidence also suggests that in postmenopausal women, increased levels of RANKL and OPG may be responsible for osteoporosis. As periodontal disease is more common in women suffering from osteoporosis, these two conditions will most likely have the inflammatory component of periodontal disease as a common factor between them, resulting in an altered RANKL/OPG ratio. Women with both osteoporosis and periodontal disease usually exhibit low levels of serum Vitamin D. This may be attributed to the inverse relationship that exists between serum Vitamin D and cytokines, which play an important role in stimulating osteoclastogenesis. They also exhibit increased concentrations of CRP, RANKL, and OPG, ultimately causing decreased levels of Vitamin D and increased bone turnover. These can, in turn, stimulate osteoclastic activity, justifying increased serum levels of CTX, thereby indicating the underlying mechanism linking the two diseases. However, a definitive mechanism still has not been established. Drugs used for the prevention and treatment of osteoporosis may have the ability to reduce both oral and systemic bone loss. These include bisphosphonates (BPs), calcitonin, hormone-replacement therapy (HRT) and selective estrogen receptor modulators (SERMs), and nutritional supplements of calcium and Vitamin D.
Strontium ranelate is a relatively new oral drug which reduces the risk of all nonvertebral fractures. It is a well-tolerated drug and can be used as an alternative to BPs. It promotes bone formation and reduces bone resorption. Antiresorptive medications only hinder the bone resorption phase and do not affect bone formation. For the prevention and treatment of osteoporosis, two classes of medications such as estrogen receptor modulators and BPs are being used. BPs are nonhydrolyzable analogs of pyrophosphate which mainly prevent calcium and phosphorous precipitation. They inhibit osteoclast-mediated bone resorption resulting in an increase in bone mass density and prevent proliferation of tumor cells and angiogenesis. They are available in two forms: oral and intravenous. Their mechanism of action is that they can decrease either their osteoclastic activity by internalization inhibiting bone resorption or their osteoclastic numbers by inhibiting recruitment of osteoclasts and accelerating their apoptosis [Figure 5]. Various studies conducted report contradictory results regarding dental implants and BP therapy. Experimental animal studies done by Stadelmann et al. in 2008 and YIldIz in 2010 have reported that BPs have a favorable effect on the bone around implants. Although studies done by Shabestari et al. have reported that administration of BPs does not influence implant stability, few other studies report the negative effect of BPs on osseointegration. If a patient is systemically unhealthy with a serious bone disease and is under high doses of the drug, the current advice is to avoid placement of an implant. Patients with existing implants and who are on BPs should be frequently examined as there can be an increase in bone density in areas adjacent to implants. If the patient experiences pain or loss of integrity occurs, the superstructure of the implant should be removed and the implant must be left submerged. Any surgery of the bone should be avoided as it can result in avascular necrosis. Patient education regarding good oral hygiene practices is important to reduce the complications of BP therapy. The main function of estrogen is to maintain or preserve bone mass. Reduced levels or its withdrawal results in an increase in the osteoclastic activity and subsequently bone loss even in the oral cavity. Several studies have revealed a positive association between features distinctive of oral bone loss (tooth loss, decreased oral bone density, and crestal ABL) to both osteoporotic and estrogen deficiency. Hence, the first line of treatment for osteoporosis is mainly HRT using estrogen. Studies have shown that patients who received HRT had reduced probing pocket depths and tooth mobility and reduced frequency of clinical attachment loss and dental pain compared to the control group. PTH has both anabolic and catabolic effects on the bone. It increases the bone mass density thereby preventing fractures and thus can be used in the treatment of osteoporosis. A study done by Miller et al. on animals revealed that PTH had the ability to reverse ABL. Systemic administration of PTH can be beneficial to the oral cavity although it is not particularly used in the treatment of ABL, suggestive of the impact it has on the osseous healing in the oral cavity. Calcium and phosphorous are the two major components of hydroxyapatite. Phosphorous, like calcium, is very important for mineralization of bone and to maintain bone homeostasis. It is usually present as phosphate in the diet. An increase in the intake of phosphorous depresses the levels of calcium transiently, subsequently leading to elevated PTH levels, which can affect the bone which can clearly influence bone. However, this effect is temporary unless calcium intake is also reduced in which case PTH remains high. Under normal physiological conditions, an increase in the phosphorus intake suppresses loss of calcium through urine and increases digestive juice secretion of calcium. The total body calcium balance is usually not affected as these two effects are approximately equal in magnitude. Vitamin D helps in intestinal calcium absorption and regulation of calcium metabolism. Calcium and Vitamin D can retard the rate of bone loss in elderly men and women if taken in adequate levels. Osteoporosis and periodontitis are diseases that affect a large number of men and women worldwide, with incidence increasing with advancing age. Both these diseases present bone loss as a common hallmark. In osteoporosis, loss of bone density may render the host highly susceptible to periodontal destruction. Understanding the underlying mechanisms of these associations will aid professionals to improve prevention, diagnosis, and treatment of these diseases. A growing body of literature has accumulated regarding the association between osteoporosis and periodontal disease and tooth loss. However, most of these studies are uncontrolled, are cross-sectional, have small sample size, and are mostly conducted on postmenopausal women. Bone loss, a characteristic feature of periodontal disease, may be easily confounded by other factors such as gender, hormone intake, smoking, race, age, stress and distress, diet, body mass, and exercise. Majority of the studies conducted indicate that an association does exist. However, the causal nature to the association is not definitely established. A systematic search of the literature was conducted in the Cochrane Library, PubMed, Web of Science (ISI), Scopus, Copernicus, Lilacs, and System for Information on Grey Literature in Europe for full articles published until 2015. Newman T, Klokkevold C. Classification of diseases and conditions affecting periodontium. Carranza's Clinical Periodontology. 10th ed. Philadelphia: Saunders; 2009. p. 101. Kim J, Amar S. Periodontal disease and systemic conditions: A bidirectional relationship. Odontology 2006;94:10-21. Pejčić A, Kojović D Grigorov I, Stamenković B. Periodontitis and osteoporosis. Med Biol 2005;12:100-3. Jeffcoat M. The association between osteoporosis and oral bone loss. J Periodontol 2005;76:2125-32. Stein SH, Livada R, Tipton DA. Re-evaluating the role of Vitamin D in the periodontium. J Periodontal Res 2014;49:545-53. Hildebolt CF. Effect of Vitamin D and calcium on periodontitis. J Periodontol 2005;76:1576-87. Bashutski JD, Eber RM, Kinney JS, Benavides E, Maitra S, Braun TM, et al. The impact of Vitamin D status on periodontal surgery outcomes. J Dent Res 2011;90:1007-12.
von Wowern N, Klausen B, Kollerup G. Osteoporosis: A risk factor in periodontal disease. J Periodontol 1994;65:1134-8. Iqbal MM. 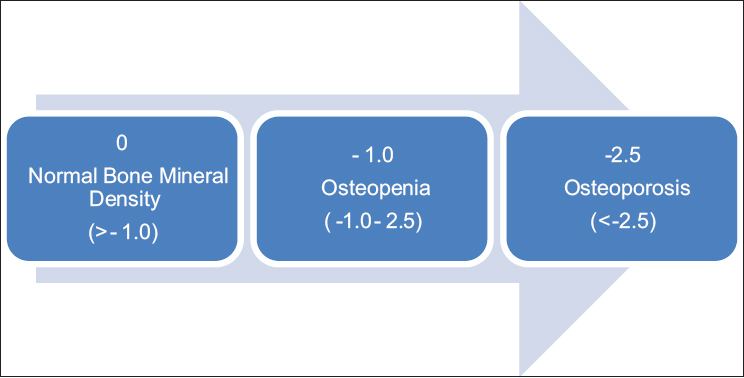 Osteoporosis: Epidemiology, diagnosis, and treatment. South Med J 2000;93:2-18. Sambrook PN, Naganathan V. How do we manage specific types of osteoporosis? Baillieres Clin Rheumatol 1997;11:597-612. Link TM. Osteoporosis imaging: State of the art and advanced imaging. Radiology 2012;263:3-17. Esfahanian V, Shamami MS, Shamami MS. Relationship between osteoporosis and periodontal disease: Review of the literature. J Dent (Tehran) 2012;9:256-64. Kanis JA. Diagnosis of osteoporosis and assessment of fracture risk. Lancet 2002;359:1929-36. Graves DT, Cochran D. The contribution of interleukin-1 and tumor necrosis factor to periodontal tissue destruction. J Periodontol 2003;74:391-401. Garlet GP, Cardoso CR, Silva TA, Ferreira BR, Avila-Campos MJ, Cunha FQ, et al. Cytokine pattern determines the progression of experimental periodontal disease induced by Actinobacillus actinomycetemcomitans through the modulation of MMPs, RANKL, and their physiological inhibitors. Oral Microbiol Immunol 2006;21:12-20. Lerner UH. Inflammation-induced bone remodeling in periodontal disease and the influence of post-menopausal osteoporosis. J Dent Res 2006;85:596-607. Boyle WJ, Simonet WS, Lacey DL. Osteoclast differentiation and activation. Nature 2003;423:337-42. Nakashima T, Kobayashi Y, Yamasaki S, Kawakami A, Eguchi K, Sasaki H, et al. Protein expression and functional difference of membrane-bound and soluble receptor activator of NF-kappaB ligand: Modulation of the expression by osteotropic factors and cytokines. Biochem Biophys Res Commun 2000;275:768-75. Saidenberg-Kermanac'h N, Cohen-Solal M, Bessis N, De Vernejoul MC, Boissier MC. Role for osteoprotegerin in rheumatoid inflammation. Joint Bone Spine 2004;71:9-13. Page RC, Kornman KS. The pathogenesis of human periodontitis: An introduction. Periodontol 2000 1997;14:9-11. Eastell R, Bauman M, Hoyle NR, Wieczorek L, editors. Bone Markers: Biochemical and Clinical Perspectives. London: Martin Dunitz Ltd.; 2001. Talwar S. Bone Markers in Osteoporosis. Endocrinology 2015;51;23. Jabbar S, Drury J, Fordham J, Datta HK, Francis RM, Tuck SP, et al. Plasma Vitamin D and cytokines in periodontal disease and postmenopausal osteoporosis. J Periodontal Res 2011;46:97-104. Hildebolt CF, Pilgram TK, Dotson M, Armamento-Villareal R, Hauser J, Cohen S, et al. Estrogen and/or calcium plus Vitamin D increase mandibular bone mass. J Periodontol 2004;75:811-6. Anil S, Preethanath RS, AlMoharib HS, Kamath KP, Anand PS. Impact of osteoporosis and its treatment on oral health. Am J Med Sci 2013;346:396-401. Otomo-Corgel J. Osteoporosis and osteopenia: Implications for periodontal and implant therapy. Periodontol 2000 2012;59:111-39. 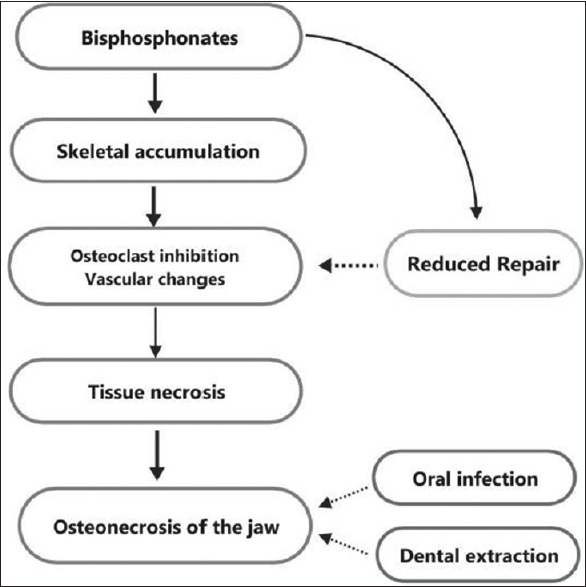 Wactawski-Wende J. Periodontal diseases and osteoporosis: Association and mechanisms. Ann Periodontol 2001;6:197-208. Basha N. Osteoporosis and periodontitis. OA Dent 2014;2:2.